Milling and turning are two important operations within CNC machining. They support machining operations to ensure the construction of components with precise specifications, and with a certain type of internal or external surface. Both CNC milling and turning have sub-operations that allows for the creation of different industrial components. BDE Manufacturing Technologies meets the component requirements of industrial customers by providing end-to-end CNC turning and milling services. We utilize the latest equipment in providing high quality CNC turning and milling services. 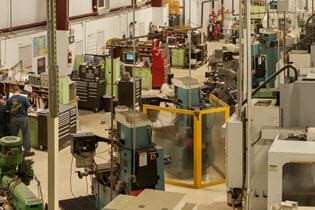 We have equipment with 3 and 4 machinery axis, as well as live tooling. The following are the various specifications to which we can manufacture your components with our turning and CNC milling services. From .914 m. to 3 ft.
• As milling and turning machinery is automated, customers can accrue huge savings due to reduced labor costs. • Our CNC turning services adhere to the regulations of ISO, RoHS, ASME, ANSI, and Mil-Spec. • With CNC milling services, we have the capability to complete the manufacturing of complex components within a short amount of time. • Our CNC turning machines can hold a variety of tools to ensure that the component are built to exact specifications as required by the customer. Please peruse through our other Capabilities pages, and the inner pages for more details. If you would like more information about our CNC turning services, please feel free to contact us via telephone on 866-262-6233, or send us an email at info@bdeinc.com.